Part 8: The Demand Side. 32. Minimum wages, employment, and the distribution of income (C. Brown). 33. Firm size and wages (W. Oi, T.L. Idson). 34. The labor market implications of international trade (G. Johnson, F. Stafford). Part 9: Looking Within Firms. 35. Individual employment contracts (J.M. Malcomson). 36. Careers in organizations: theory and evidence (R. Gibbons, M. Waldman). 37. Mobility and stability: the dynamics of job change in labor markets (H.S. Farber). 38. Executive compensation (K.J. Murphy). Part 10: Interactions Between Demand and Supply. 39. 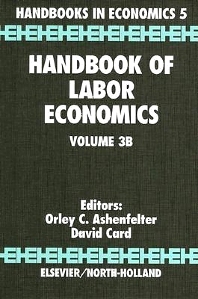 New developments in models of search in the labor market (D.T. Mortensen, C.A. Pissarides). 40. The analysis of labor markets using matched employer-employee data (J. Abowd, F. Kramarz). 41. Gross job flows (S.J. Davis, J. Haltiwanger). Part 11: Emergent Labor Markets. 42. Labor markets in the transitional central and east european economies (J. Svejnar). 43. Labor markets in developing countries (J.R. Behrman).